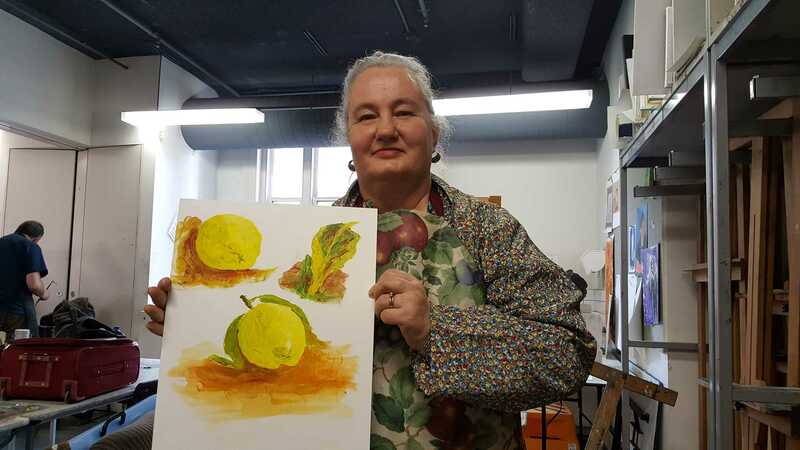 My third class in ‘Produce Paintings’ and ‘Produce Drawings’ (these being subjects that are part of ‘Certificate III in Visual Arts’) proved to be productive classes for me this week. I listened carefully to what our teachers had to say and applied that instruction to my painting and drawing creative efforts. While oil painting still proves to be a difficult creative skill to manage, I did feel I had made one step forward towards better understanding this particular paint type and its application process. Drawing, as I have indicated in my blogs for class 1 and class 2, provides me with a less frustrating experience. Please click on the links below to view classes one and two blogs. My initial palette hadn’t included Spectrum Blue and Spectrum Red. 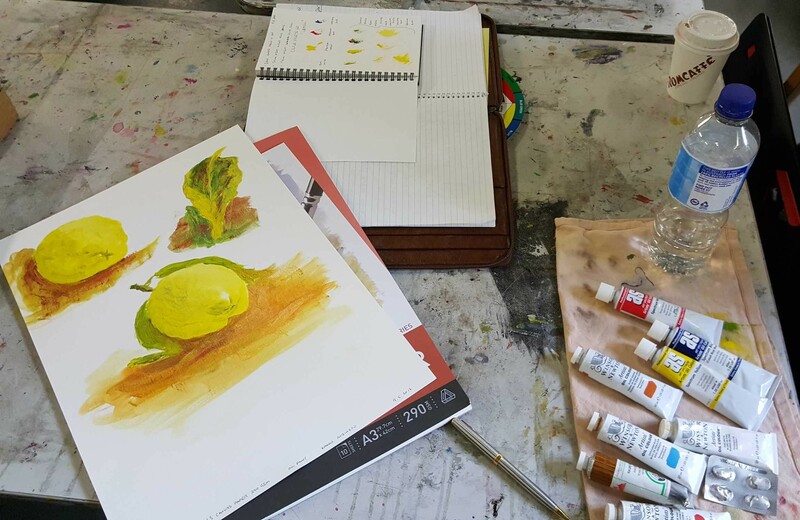 Our teacher, Vin, explained that without the Blue and the Red, I wouldn’t be able to achieve the light and dark, the hues needed to create the lemon colour variations. Vin said without these colours, everything would start to look greenish! Once I was happy with my colour palette, it was time to commence painting. Using the paint brush as a pencil, I commenced applying the paint to the canvas paper, which proved, once again, a major challenge but exciting as well. 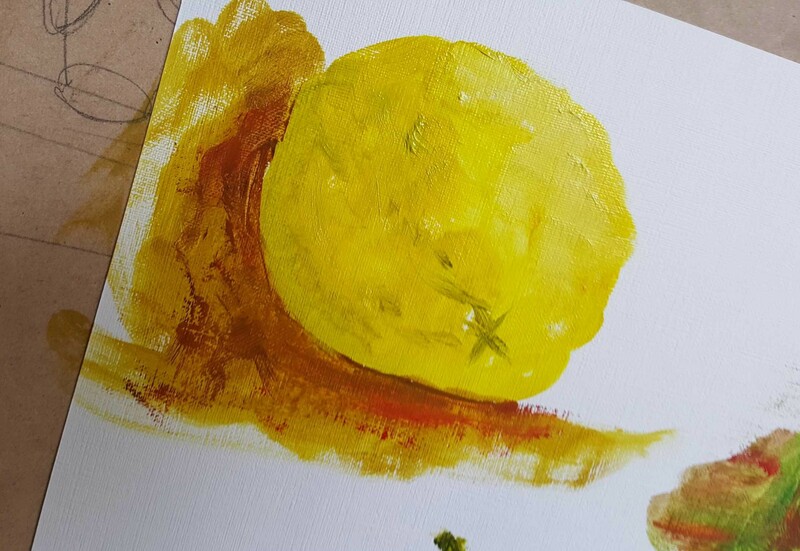 I could feel that I was making some small progress towards understanding how oil paint applies onto the canvas paper and about the use of different hues of oil paint colour, to help achieve light and shade within the painting itself. My lemons are ok – I prefer the top left hand corner lemon to the other – and the leaf on the top right hand corner, not at all! I had used a small palette knife to spread oil paint on the leaf and ruined it, for sure. Vin stated that it was best to resist using a palette knife on paintings and if I do, just very sparingly. I can now appreciate why! Start with orange Conte Crayon – and lightly sketch in the overall portrait – shaping the face first and then basic detailing with just the one colour. Look for shadows and use the side of the Conte Crayon to achieve. NB: I didn’t have the colour orange, so I just worked with two colours being white and brown. Using the white Conte Crayon – sketch in the ‘light’ seen within the portrait image. 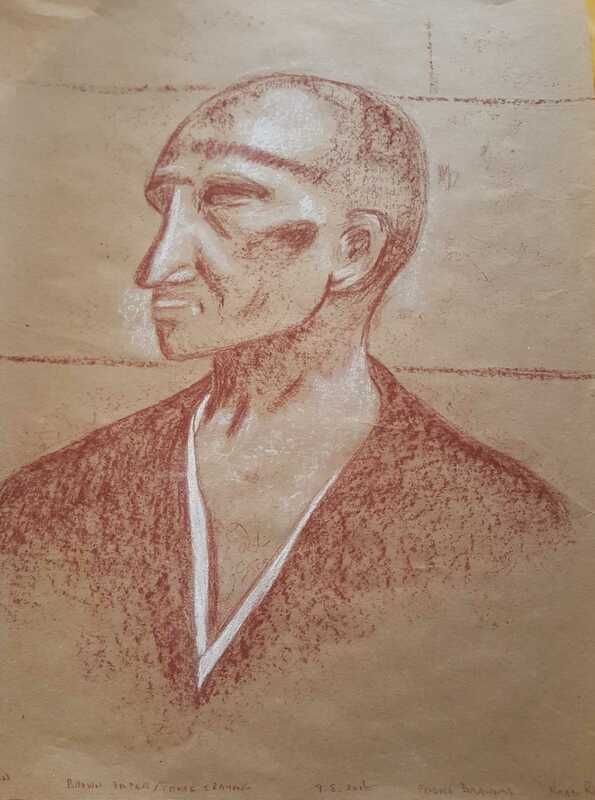 Using the brown Conte Crayon – sketch in the ‘dark’ seen with the portrait image. NB: Allow the brown paper to do a lot of the work. Being my first time ever to draw with Conte Crayons I was a little apprehensive, but once I got started it became an enjoyable experience. I was pleased with my portrait and the teacher Toby had some good comments to make about it, so that made me happy as well. 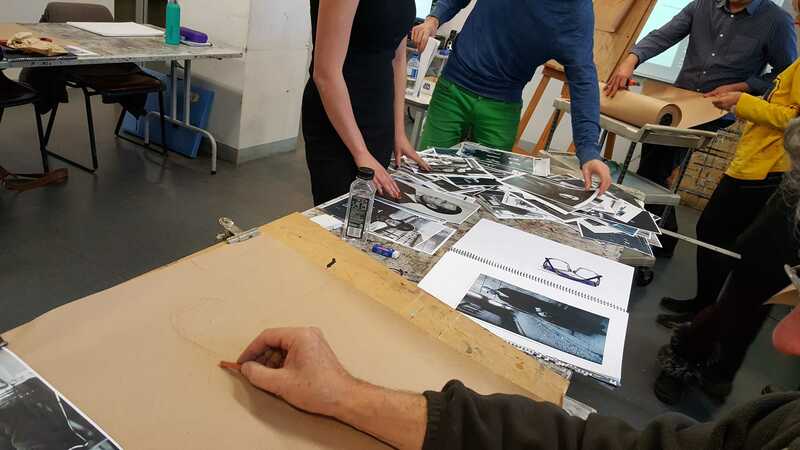 In order to ‘fix’ the Conte Crayons, I will need to spray my drawing when I get home with a fixative, to help protect my drawing – another learning process! At home, over a number of days between this drawing class and the next, I did a couple of drawings in my ‘Produce Drawings’ Visual Diary. Once more, I am feeling very fortunate in being able to participate in these painting and drawing classes. 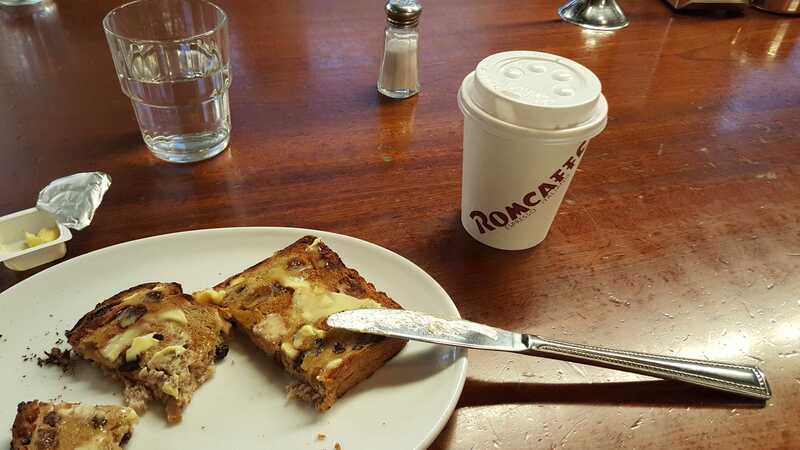 Being able to soak up the ambiance of Degraves Street itself during my class break very much adds to the overall pleasure of the day’s creative outcomes. Art for therapy at its best for sure…. This entry was posted in CAE Cert III Visual Arts, My art and tagged Art Therapy, Artist Blog, Certificate III in Visal Arts, Conte Crayons, Drawing Classes, ido art karen robinson, Karen Robinson, Oil Painting, Painting Classes, Spectrum Oil Paints, Toby Dutton CAE Drawing Teacher/Artist, Vin Ryan CAE Painting Teacher/Artist, visual diary by idoartkarenrobinson. Bookmark the permalink.